Tragedy struck the Morgan family when husband Rich was diagnosed with an incurable cancer with very few days left to live. As wife Julie and Rich reminisced about their younger days, they fondly remembered a pizza shop, Steve's Pizza in Battle Creek, Michigan where they used to have dinner over 25 years ago when they lived there. The couple were in fact planning to visit Steve's pizza again after all these years when they were hit with the diagnosis of cancer. What the couple did not know was that Julia's father Dalke was listening in and called up Steve's Pizza hoping to get the owners to make a call or send a letter to Rich to keep as a namesake for all the memories. The restaurant's manager, Dalton Shaffer, picked up the phone. At 18 years of age, Dalton was not even born when the Morgan family used to visit the pizza shop. And yet, his actions after talking to Julia's dad showcased a kindness far beyond his years. 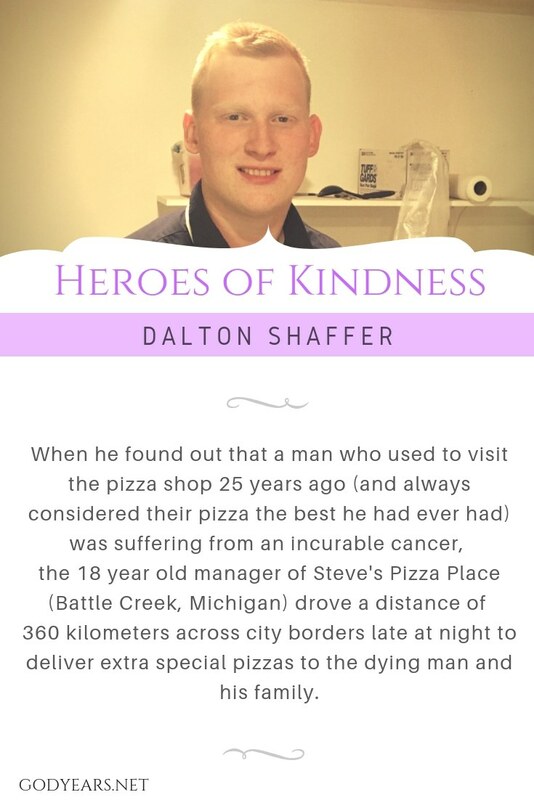 Shaffer informed the man that he would personally drop by and deliver two extra special pepperoni pizzas to the Morgans house after he closed for the night. Yes, pizza delivery is quite common across the world but two factors distinguish this particular delivery. Steve's pizza had a strict take-out only policy and never delivered. The Morgans lived in Indianapolis, 225 miles (360 kilometers) away! The 18 year old was not lying, however. After he was done for the night at Steve's Pizza, Dalton Shaffer drove for three and a half hours straight across city borders to the Morgan's house for this unbelievable delivery of two sixteen inch pizzas at 2 in the morning. Dalton refused Dalke's offer of paying for a hotel room to sleep in overnight (and even refused money for the pizzas and gas before Dalke forced some money into his pocket) and drove straight back to Michigan where he went to work the next morning after a total journey of 720 kms. Julia and Rich were informed about what the young man had done for them only when they woke up the next morning, bursting into tears at this unbelievable act of kindness. Dalton himself did not even inform his uncle, the owner of Steve's pizza about what he had done. The news went public only after Julie mentioned what Dalton did in a Facebook post. For the last few years, I have been maintaining a list of real life Heroes of Kindness and Compassion from across the world. The aim, of course, is to restore faith in humanity for those who need it most. 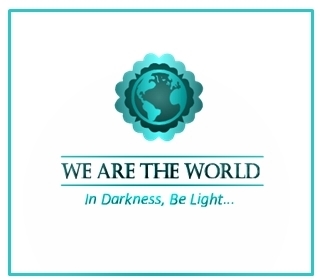 This post is also part of the We Are the World Blogfest, a monthly event to showcase stories of compassion. Your cohosts for this month are: Eric Lahti, Inderpreet Uppal, Shilpa Garg, Mary Giese and myself. This is such an amazing story of kindness and compassion. I love how Dalton went the extra mile(s), literally and figuratively and delivered smiles and happiness in Morgan family! 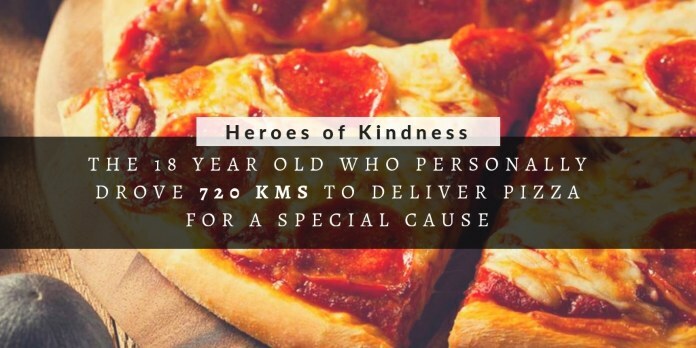 This epic journey of kindness from one so young, reinstated my faith in the future of humanity. Those who will replace us one day have what it takes to make the world a better place. Wow!! such kindness and large heartedness in an 18 year old. Yet we moan our youth of today for not having the ethics of yore! Amazing amazing guy- may god bless him!! Really sweet story. It made me a bit tearful to read it. Very nice young man.